When working with a staffing firm you’ll notice that most of its employees have “CSP” or other credentials after their names, but what does that mean for you? A certified staffing professional, specifically one with credentials from the American Staffing Association, has expertise in various in employment laws, the pre-employment process, client agreements, and much more. Moreover, a professional certified through the American Staffing Association must adhere to the ASA Code of Ethics, promising that the staffing professional acts with high ethical standards when working with clients and candidates. An ASA certified staffing professional can help answer questions on employment and labor law both at the federal and state levels. 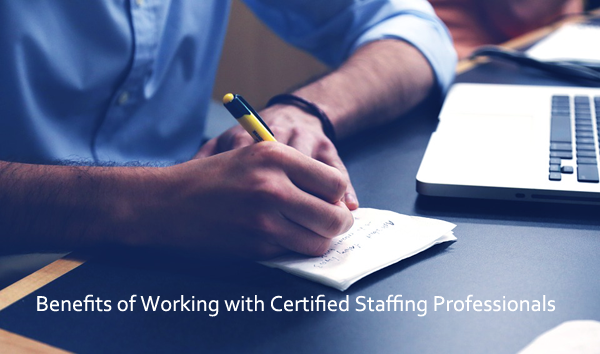 The credential is essential for certifying a staffing employee’s expertise to work within the bounds of federal and state laws and regulations. Among the 15 topics a CSP is knowledgeable on are: candidate screening, equal employment opportunity laws, Immigration Reform and Control Act, drug testing in the workplace, wage and hour laws, FMLA, OSHA, and workers’ compensation. The CSC program focuses on federal employment law specific to recruiters, state licensing and registration laws applicable to direct hire firms, agreements with clients, and Equal Employment Opportunity Laws. TSC certification is for professionals working in technical, IT and scientific staffing. The program includes everything in the CSP program plus content on per diem rules, H-1B visas and worker classification. Professionals who pass the TSC exam automatically obtain their CSP certification. To maintain their certification and keep up-to-date on laws and regulations, ASA certified staffing professionals must obtain continuous education credits through attending seminars and conferences, ASA chapter events, or watching ASA webinars. And help protect you from legal liabilities. And act as a go-between should you have an issue with your employer. With so many staffing agencies to choose from, how can you be sure you’re selecting a partner you can trust? Checking for credentials is one step in the process. Download our free mini brief “Staffing Agency Ethics” to help you weigh your options.